The kids I babysit often show up in the morning with toys from home in their hands. With Azelyn's toys I never have to wonder later in the day if that doll is hers or our...with three boys in my family we don't have dolls! Kyle and Keeran sometimes bring little toy cars, though, and I often have to check with Nathan or Kyle to identify who owns a particular car. We have so many little cars that there's no way I can keep them all straight, but it's amazing how Nathan knows immediately "that's mine" or "that's Kyle's." Though to me all the cars look alike, they know which ones to claim as their own. One day last week, during my morning devotions, I read part of Jeremiah 42 and I was struck by the pronouns used to express ownership. Did you see it? The Isrealites first asked Jeremiah to pray to "the Lord your God." Though they were God's chosen people, they weren't claiming God as their own. They saw Him as Jeremiah's God, but not as theirs. Jeremiah said, "I will certainly pray to the Lord your God" thereby reminding them that the Lord was their God too, not just his God. Of course, at this point in history, the people of Israel had not been following God very well. They were, in fact, so far away from God that Jeremiah was sent as a prophet to warn the people of the terrible judgement that would come if they didn't change their ways. It is understandable, then, why they might see God as belonging to Jeremiah, but not to them. But that wasn't the case at all. Jeremiah had been sent to them precisely because God still desired a relationship with them. He wanted them to change their ways and return to worshiping Him wholeheartedly. He wanted them to claim Him as their God. The same is true for us. Regardless of what our past has held, God eagerly desires us to turn to Him, to claim Him as our own. The New Testament is full of references to God's love for us and to His desire that we believe in Him. Here are just a few examples. John 1:12, 13 - "Yet to all who did receive him, to those who believed in his name, he gave the right to become children of God— children born not of natural descent, nor of human decision or a husband’s will, but born of God." 1 John 3:1 - "See what great love the Father has lavished on us, that we should be called children of God! And that is what we are!" 2 Peter 3:9 - "The Lord is not slow in keeping his promise, as some understand slowness. Instead he is patient with you, not wanting anyone to perish, but everyone to come to repentance." Through Jesus anyone, anywhere can claim the Lord as their own God, which is exactly what He wants us to do! He wants each and every one of us to be able to say "The Lord, my God." 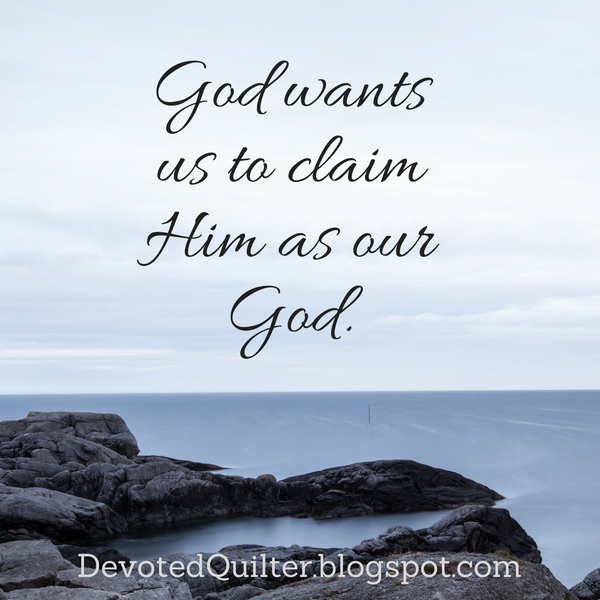 Do you claim Him as your own?